ESPN did not handle this well. Oklahoma and Georgia went into double overtime in an insane Rose Bowl, which saw the Bulldogs come out on top 54-48 to advance to the national title game. But the high-scoring game going into two overtimes caused a problem for ESPN, in that the Alabama-Clemson Sugar Bowl had also started. And we have both playoff games overlapping right now. Believe that’s a first? ESPN warned viewers that the Sugar Bowl would be on ESPN2 until the conclusion of the Rose Bowl. So fans looking to watch the Alabama-Clemson game changed the channel to ESPN2, but when the Rose Bowl ended, ESPN2 switched away from the Sugar Bowl without warning. This happened while Alabama had 3rd-and-goal in the Sugar Bowl, so many fans missed a key goal line play — and for some the ensuing fourth down, which resulted in an Alabama field goal — while they were scrambling to find the remote and switch the channel to ESPN. On some average college football day, this may not be a huge deal, but this is the College Football Playoff Semifinal we’re talking about. Naturally, this switch without warning angered many viewers. 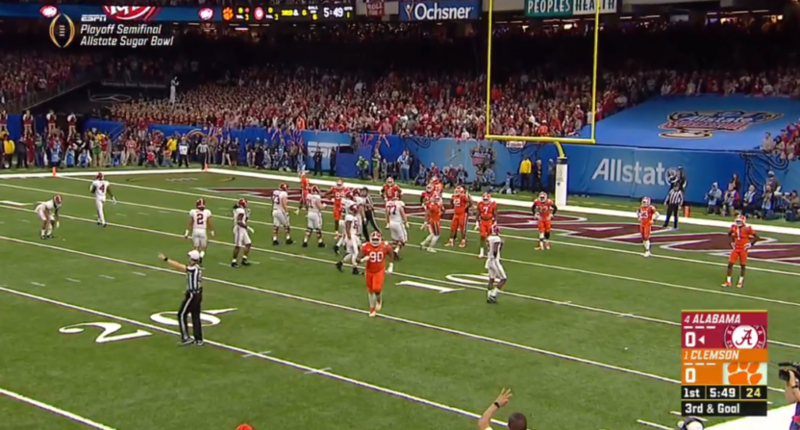 You know @ESPN you could have picked a better time to switch the #SugarBowl from ESPN2 than 1st-and-goal. Missed the first score of the game. @espn next time you start a game on ESPN2 due to the other one on ESPN running late, a heads up to switch back channels would be nice instead of just changing it. This was obviously a tough situation for ESPN and ESPN2, but at least warn the viewers about the switch or just wait until a commercial break.